This pergola was placed in a spot that takes advantage of a view of the pool as well as the scenery beyond. If you have an exceptionally small space, such as a narrow breezeway between home and garage, a pergola might make your landscape feel dark or confined. Sometimes the window placement or a low roofline on the home just doesn’t leave enough room for a pergola to be attached to the house. In that case, pulling the pergola out into the landscape is a better plan. In overcast climates, additional shade over a window just makes the room feel dark. If you want to maximize light in a room, building a pergola right outside of it may not be the best plan. 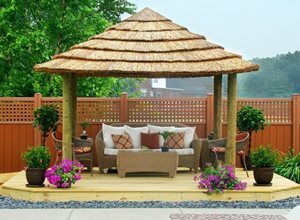 Pergolas and patio covers let you spend time in your landscape even on the most sweltering of summer days (see Landscaping for Sunny Areas). Pergolas are also great for defining spaces within the landscape and creating an inviting transition between indoors and out. Pergolas and similar structures work great both within the landscape and right next to the home. When placed within the landscape, a pergola is visible from indoors and sets a beautiful scene. 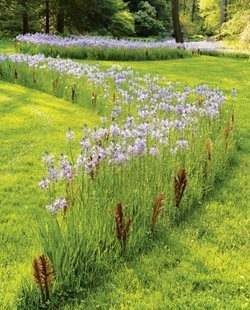 “They act as a visual element to draw you out into the landscape,” says Dan Berger of LandPlan's Landscaping, Inc. in Pleasanton, CA. 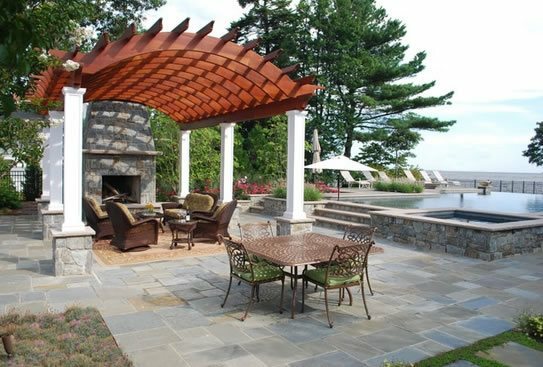 When deciding where to place a pergola within the landscape, think about where you’d most enjoy spending time. What area of the landscape has the best views? Are there any spots that are sheltered from wind? What time of day do you want to sit under your pergola, and which areas of the landscape are most pleasant at that time? Pro Tip: Consider the position of the sun at sunset and sunrise before determining where to build your pergola. The angle of the sunlight will determine how much shade is produced. Ryan Aakre of Signature Landscapes Inc. in Fargo, ND points out that pergola placement has a lot to do with the movement of the sun. “They’re never going to give you shade all day long, just because they’re stationary and the sun is moving,” he says. So take your lifestyle and schedule into account when planning where to place any outdoor structures to make sure you create the best environment for the time of day you’re likely to spend time there. Of course, if you prefer to entertain closer to the kitchen or extend your indoor space onto your patio, then a structure that’s attached to the house or right next to it can be a better choice. 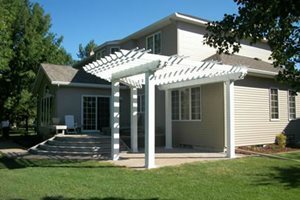 When placing a patio cover, which is a pergola structure that’s attached to the house, the architecture of the home will determine many of your decisions. What door will you use to access the covered patio? Are there any windows which influence the placement of the support beams? How tall is the roofline? The patio cover will usually sit below that point. You may also want to consider whether the patio cover is serving some purpose from indoors. If you have south-facing windows that get too hot during the day, a patio cover lets you reclaim these previously overheated parts of your home by casting filtered shade on these windows. However, if you have a low roofline or a side of the house where you don’t get as much sun, the pergola can sometimes make the inside of the home feel dark. There are varying opinions about whether to create a pergola structure that is attached to the home, or freestanding. Attaching a patio cover to the house can save money on materials and installation, because fewer support beams are needed to hold up the roof. However, Berger points out that any time you pierce the shield of a home, it has the potential to make insulation or other protective measures less effective. Your climate also plays a part. 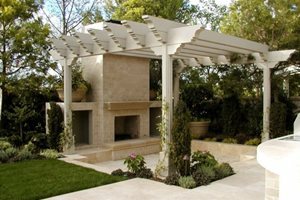 “Our winters are cold and the heavy clay soil shifts, so attaching a pergola to the home has the potential to tear something off the house, even if you go down four feet with the footings,” Aakre cautions. If you want a structure built next to the home but live in a climate where this is a concern, you can always build a freestanding structure and place it right next to the house. 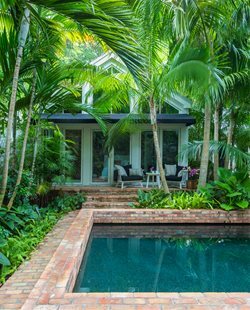 Alison Terry, a landscape architect in Fullerton, CA says that the style of home can also have an impact on your choice. “If the roofline is very low, such as with a 1950’s or 1960’s house, the patio cover will be too low for head clearance,” she says. “If that’s the case, there’s also the option of doing an open-gable attached patio cover.” That’s when you build a new gable on your roof to go with the patio cover. It’s a little more expensive, but the nice thing is that this type of structure doesn’t put any extra weight on your roof because it’s built with an independent framework which supports itself. 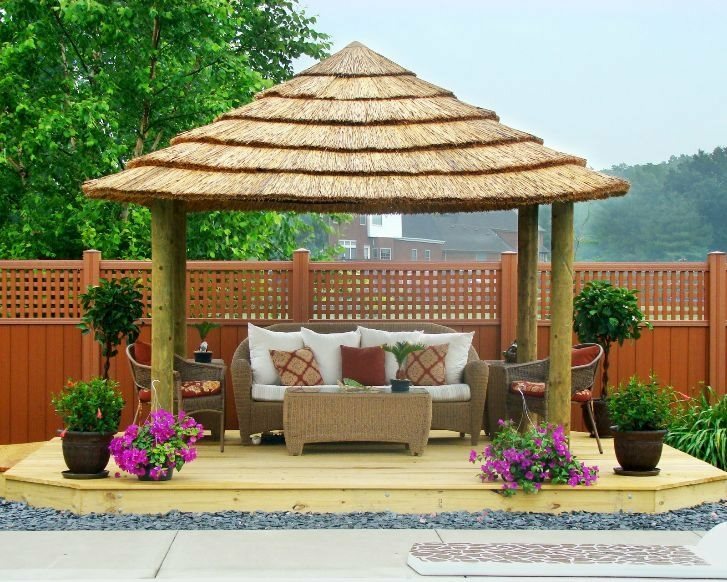 A pergola with a solid roof, this one is covered in thatch, will provide the complete shade that is necessary in hot climates. 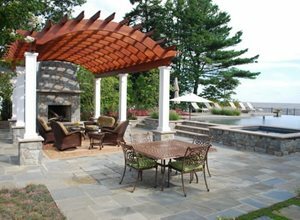 Pergolas can be built with either slatted or solid roofs, so you can choose how much cover you need from the elements. The style of the roof depends on your climate and how you want to use the space. If you live in Arizona and want to entertain during the day, an open roof pergola just won’t cast enough shade for you to feel comfortable outside. 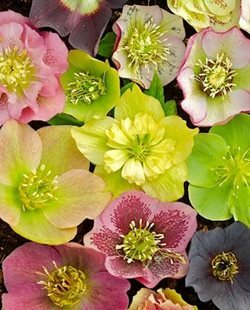 Yet for people who live in milder climes or plan to entertain in late afternoon or early evening, an open roof can cast filtered light that makes the sun feel luxurious rather than overwhelming. An open roof also lets you enjoy looking at the sky or trees, and feels more airy. For people in a rainy area, a solid roof can mean your pergola doubles as a seating area during warm rain showers, and extends the number of months you can enjoy sitting out there. But in areas with heavy snowfall, a solid roof just collects snow, a weight load that most pergolas are not engineered to take. Baron Biedenweg from Archadeck of Fort Wayne, IN says that if someone in his climate wants a solid roof, he recommends an open porch pavilion instead, which would have a real roof with a pitch, gutters, and a framework designed to support the snow load. How you plan to use the space will also factor into the size. A 10’ x 10’ pergola has just enough floor space for two chairs and a bistro table, but obviously wouldn’t accommodate an outdoor kitchen or a bigger family. A pergola structure can be as wide as you like, as long as it’s built with enough beams to support the roof. The minimum height of a pergola should be no lower than 7’6” to provide enough head room, though most projects call for a range of 8-10’ in height. A lower ceiling feels right-sized for intimate gatherings, while a larger roof is more in scale with a larger structure. If you plan to use chandelier lighting inside the pergola for outdoor dining, you’ll want to have more height to leave room for that.